Zinn predicts: Humpty Dumpty will fall! That seems unlikely. Until the questions surrounding the Iraqi war are answered, Congress and the public may strongly resist more of President Bush's warmaking. Presidential statements, particularly on matters of national security, are held to an expectation of the highest standard of truthfulness. A president cannot stretch, twist or distort facts and get away with it. President Lyndon Johnson's distortions of the truth about Vietnam forced him to stand down from reelection. President Richard Nixon's false statements about Watergate forced his resignation. Frankly, I hope the WMDs are found, for it will end the matter. Clearly, the story of the missing WMDs is far from over. And it is too early, of course, to draw conclusions. But it is not too early to explore the relevant issues. Readers may not recall exactly what President Bush said about weapons of mass destruction; I certainly didn't. Thus, I have compiled these statements below. In reviewing them, I saw that he had, indeed, been as explicit and declarative as I had recalled. "Iraq has stockpiled biological and chemical weapons, and is rebuilding the facilities used to make more of those weapons." "The Iraqi regime . . . possesses and produces chemical and biological weapons. It is seeking nuclear weapons." "We know that the regime has produced thousands of tons of chemical agents, including mustard gas, sarin nerve gas, VX nerve gas." "We've also discovered through intelligence that Iraq has a growing fleet of manned and unmanned aerial vehicles that could be used to disperse chemical or biological weapons across broad areas. We're concerned that Iraq is exploring ways of using these UAVS for missions targeting the United States." "The evidence indicates that Iraq is reconstituting its nuclear weapons program. Saddam Hussein has held numerous meetings with Iraqi nuclear scientists, a group he calls his "nuclear mujahideen" - his nuclear holy warriors. Satellite photographs reveal that Iraq is rebuilding facilities at sites that have been part of its nuclear program in the past. Iraq has attempted to purchase high-strength aluminum tubes and other equipment needed for gas centrifuges, which are used to enrich uranium for nuclear weapons." Should The President Get The Benefit Of The Doubt? 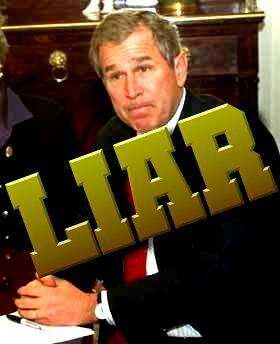 When these statements were made, Bush's let-me-mince-no-words posture was convincing to many Americans. Yet much of the rest of the world, and many other Americans, doubted them. As Bush's veracity was being debated at the United Nations, it was also being debated on campuses - including those where I happened to be lecturing at the time. On several occasions, students asked me the following question: Should they believe the President of the United States? My answer was that they should give the President the benefit of the doubt, for several reasons deriving from the usual procedures that have operated in every modern White House and that, I assumed, had to be operating in the Bush White House, too. First, I assured the students that these statements had all been carefully considered and crafted. Presidential statements are the result of a process, not a moment's thought. White House speechwriters process raw information, and their statements are passed on to senior aides who have both substantive knowledge and political insights. And this all occurs before the statement ever reaches the President for his own review and possible revision. Second, I explained that - at least in every White House and administration with which I was familiar, from Truman to Clinton - statements with national security implications were the most carefully considered of all. The White House is aware that, in making these statements, the President is speaking not only to the nation, but also to the world. Third, I pointed out to the students, these statements are typically corrected rapidly if they are later found to be false. And in this case, far from backpedaling from the President's more extreme claims, Bush's press secretary, Ari Fleischer had actually, at times, been even more emphatic than the President had. For example, on January 9, 2003, Fleischer stated, during his press briefing, "We know for a fact that there are weapons there." In addition, others in the Administration were similarly quick to back the President up, in some cases with even more unequivocal statements. Secretary of Defense Donald Rumsfeld repeatedly claimed that Saddam had WMDs - and even went so far as to claim he knew "where they are; they're in the area around Tikrit and Baghdad." Finally, I explained to the students that the political risk was so great that, to me, it was inconceivable that Bush would make these statements if he didn't have damn solid intelligence to back him up. Presidents do not stick their necks out only to have them chopped off by political opponents on an issue as important as this, and if there was any doubt, I suggested, Bush's political advisers would be telling him to hedge. Rather than stating a matter as fact, he would be say: "I have been advised," or "Our intelligence reports strongly suggest," or some such similar hedge. But Bush had not done so. So what are we now to conclude if Bush's statements are found, indeed, to be as grossly inaccurate as they currently appear to have been? After all, no weapons of mass destruction have been found, and given Bush's statements, they should not have been very hard to find - for they existed in large quantities, "thousands of tons" of chemical weapons alone. Moreover, according to the statements, telltale facilities, groups of scientists who could testify, and production equipment also existed. So where is all that? And how can we reconcile the White House's unequivocal statements with the fact that they may not exist? Even before formally declaring war against Saddam Hussein's Iraq, the President had dispatched American military special forces into Iraq to search for weapons of mass destruction, which he knew would provide the primary justification for Operation Freedom. None were found. Throughout Operation Freedom's penetration of Iraq and drive toward Baghdad, the search for WMDs continued. None were found. As the coalition forces gained control of Iraqi cities and countryside, special search teams were dispatched to look for WMDs. None were found. During the past two and a half months, according to reliable news reports, military patrols have visited over 300 suspected WMD sites throughout Iraq. None of the prohibited weapons were found there. British Prime Minister Tony Blair is also under serious attack in England, which he dragged into the war unwillingly, based on the missing WMDs. In Britain, the missing WMDs are being treated as scandalous; so far, the reaction in the U.S. has been milder. New York Times columnist, Paul Krugman, has taken Bush sharply to task, asserting that it is "long past time for this administration to be held accountable." "The public was told that Saddam posed an imminent threat," Krugman argued. "If that claim was fraudulent," he continued, "the selling of the war is arguably the worst scandal in American political history - worse than Watergate, worse than Iran-contra." But most media outlets have reserved judgment as the search for WMDs in Iraq continues. Still, signs do not look good. Last week, the Pentagon announced it was shifting its search from looking for WMD sites, to looking for people who can provide leads as to where the missing WMDs might be. Undersecretary of State for Arms Control and International Security John Bolton, while offering no new evidence, assured Congress that WMDs will indeed be found. And he advised that a new unit called the Iraq Survey Group, composed of some 1400 experts and technicians from around the world, is being deployed to assist in the searching. But, as Time magazine reported, the leads are running out. According to Time, the Marine general in charge explained that "We've been to virtually every ammunition supply point between the Kuwaiti border and Baghdad," and remarked flatly, "They're simply not there." Perhaps most troubling, the President has failed to provide any explanation of how he could have made his very specific statements, yet now be unable to back them up with supporting evidence. Was there an Iraqi informant thought to be reliable, who turned out not to be? Were satellite photos innocently, if negligently misinterpreted? Or was his evidence not as solid as he led the world to believe? The absence of any explanation for the gap between the statements and reality only increases the sense that the President's misstatements may actually have been intentional lies. Even now, while the jury is still out as to whether intentional misconduct occurred, the President has a serious credibility problem. Newsweek magazine posed the key questions: "If America has entered a new age of pre-emption --when it must strike first because it cannot afford to find out later if terrorists possess nuclear or biological weapons--exact intelligence is critical. How will the United States take out a mad despot or a nuclear bomb hidden in a cave if the CIA can't say for sure where they are? And how will Bush be able to maintain support at home and abroad?" In an apparent attempt to bolster the President's credibility, and his own, Secretary Rumsfeld himself has now called for a Defense Department investigation into what went wrong with the pre-war intelligence. New York Times columnist Maureen Dowd finds this effort about on par with O. J. 's looking for his wife's killer. But there may be a difference: Unless the members of Administration can find someone else to blame - informants, surveillance technology, lower-level personnel, you name it - they may not escape fault themselves. Congressional committees are also looking into the pre-war intelligence collection and evaluation. Senator John Warner (R-VA), chairman of the Senate Armed Services Committee, said his committee and the Senate Intelligence Committee would jointly investigate the situation. And the House Permanent Select Committee on Intelligence plans an investigation. These investigations are certainly appropriate, for there is potent evidence of either a colossal intelligence failure or misconduct - and either would be a serious problem. When the best case scenario seems to be mere incompetence, investigations certainly need to be made. One is that [the WMDs] were spirited out of Iraq, which maybe is the worst of all possibilities, because now the very thing that we were trying to avoid, proliferation of weapons of mass destruction, could be in the hands of dozens of groups. Second, that we had bad intelligence. Or third, that the intelligence was satisfactory but that it was manipulated, so as just to present to the American people and to the world those things that made the case for the necessity of war against Iraq. Senator Graham seems to believe there is a serious chance that it is the final scenario that reflects reality. Indeed, Graham told CNN "there's been a pattern of manipulation by this administration." Graham has good reason to complain. According to the New York Times, he was one of the few members of the Senate who saw the national intelligence estimate that was the basis for Bush's decisions. After reviewing it, Senator Graham requested that the Bush Administration declassify the information before the Senate voted on the Administration's resolution requesting use of the military in Iraq. But rather than do so, CIA Director Tenet merely sent Graham a letter discussing the findings. Graham then complained that Tenet's letter only addressed "findings that supported the administration's position on Iraq," and ignored information that raised questions about intelligence. In short, Graham suggested that the Administration, by cherrypicking only evidence to its own liking, had manipulated the information to support its conclusion. Recent statements by one of the high-level officials privy to the decision making process that lead to the Iraqi war also strongly suggests manipulation, if not misuse of the intelligence agencies. Deputy Secretary of Defense Paul Wolfowitz, during an interview with Sam Tannenhaus of Vanity Fair magazine, said: "The truth is that for reasons that have a lot to do with the U.S. government bureaucracy we settled on the one issue that everyone could agree on which was weapons of mass destruction as the core reason." More recently, Wolfowitz added what most have believed all along, that the reason we went after Iraq is that "the country swims on a sea of oil." Krugman is right to suggest a possible comparison to Watergate. In the three decades since Watergate, this is the first potential scandal I have seen that could make Watergate pale by comparison. If the Bush Administration intentionally manipulated or misrepresented intelligence to get Congress to authorize, and the public to support, military action to take control of Iraq, then that would be a monstrous misdeed. Nixon claimed that his misuses of the federal agencies for his political purposes were in the interest of national security. The same kind of thinking might lead a President to manipulate and misuse national security agencies or their intelligence to create a phony reason to lead the nation into a politically desirable war. Let us hope that is not the case.